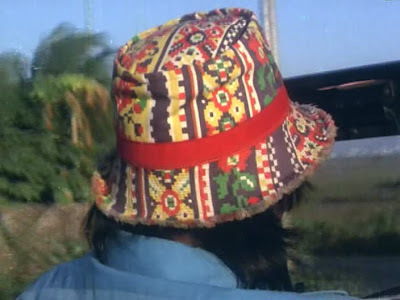 In a masala-appropriate coincidence, Temple and I both recently selected vintage movies simply because of a hat that appeared in the film. (Hers is Yari Dushmani.) You can understand why I had to have this DVD as soon as I pulled it out of the bin at Planet M.
Fortunately, the hat was not a lie. Paapi is fantastic. 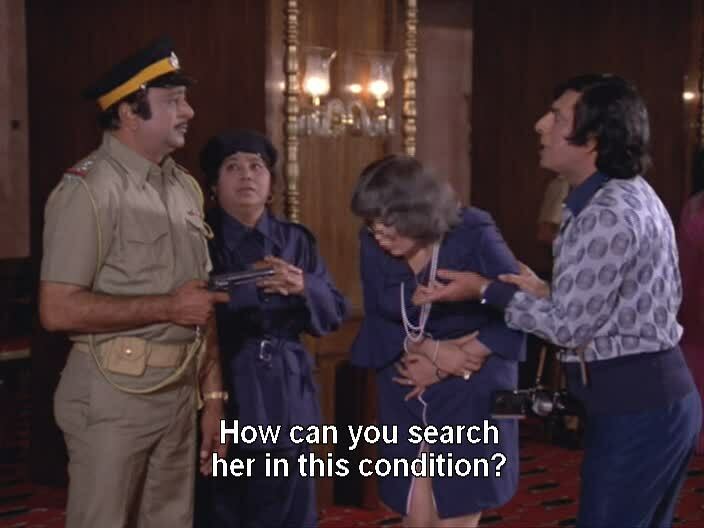 Within seconds of the production banner, we have a lechy, shirtless Kamal Kapoor; an innocent, shirtless Heena Kausar; hot pink walls; a fake passport; a gold medallion; a fedora; Iftekhar as a police officer/father figure to a family of orphans; a motorcycle; and a stolen medal. If that isn't enough, someone looks out his window to see a party full of out-of-their-senses white folks dancing so suggestively that he is stirred into a murderous, rapey rage in the middle of the night/thunderstorm/a qawwali-like song led by Manmohan Krishna belting lyrics like "Clouds of sin are thundering and it is raining sin!" as the music intertwines with the firangis' hi-fi, someone almost gets burned alive in a haystack, someone else falls into a puddle and drowns, and then the sky turns red and the title drips across the screen like blood or tears. That's all in the first eight minutes. Excuse me while I pause to catch my breath. Basically, this film is 1970s masala magic of the highest order* and I am so happy the hat led me to it. The long-lost siblings are so beautifully emotional about each other before their reunion. 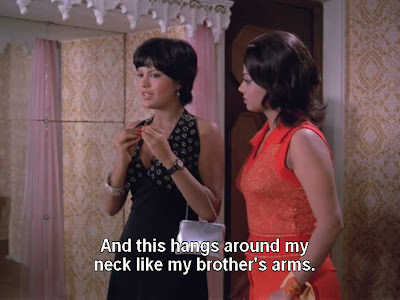 One of them is even a sister, and as an adult (Zeenat Aman) she is not a prostitute or a long-suffering all-but-servant but a sought-after criminal with thieving, dancing, and allying skills. There are layers of villains (including the voice, but not the body, of Amrish Puri), relevant comic side plots, people who might not be dead after all, groovy clothes and furniture, a full-on role for Padma Khanna, tons of character actors and supporting players, and questions about the redemptive power of love and whether any of us has the right to judge another's wrongdoings. It has a few unfortunate detours about women—like Sanjeev Kumar being thrilled to find out that Zeenat has remained pure while hanging out with the criminal gang, never mind that she has pointed a gun at him and has been robbing people—but they're brief and seem to have little impact on the characters or their actions. As I was writing this post, I began to feel bad that I didn't have more to say about Paapi. 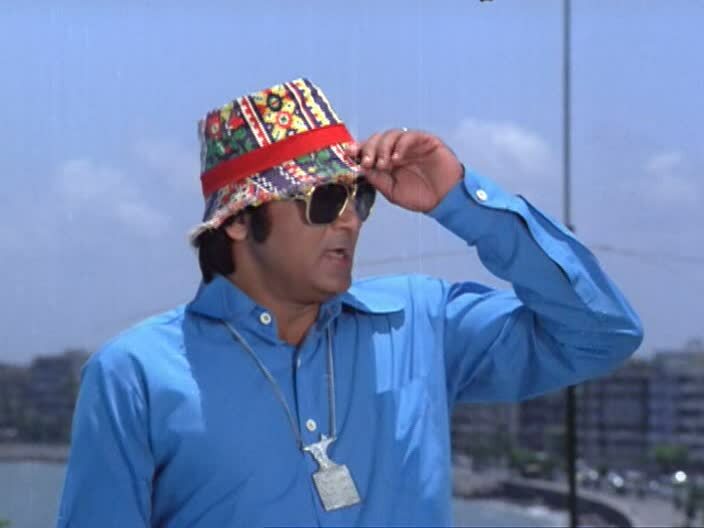 But then I realized that being called top-notch 70s masala is no small thing. In fact, it's one of the most important and heart-felt compliments I could ever give a film. So makers of Paapi, be proud! The songs by Bappi Lahiri are fantastic. My favorite is "Pyaar Hai Gunah," a nightclub number that introduces Padma Khanna. Watch it here courtesy of Papy Potage! She is fabulous in this film and for once is given a lot to work with. It's the best role I've seen for her after Chunaoti, and in this one she is friends and allies with the heroine rather than a snarling competitor. She even talks sense into the heroine at her darkest moment, empathizing over a life that seems to have been lived for nothing and providing a very pragmatic and noble, if filmi, light at the end of a philosophical tunnel. Lots of good disguises and shenanigans. For example, if you have seen Kahaani, you will know exactly what is happening here. Zeenat slips someone a mickey. Disguises for the head bad guy on the left and Padma on the right. The acting is mostly right on pitch. 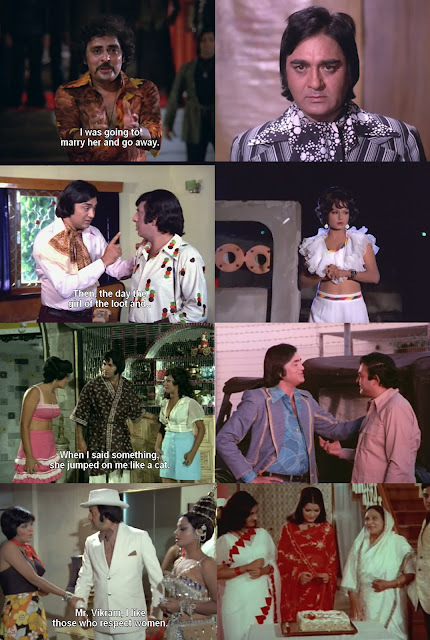 Zeenat overdoes it a bit when her character learns the news about her long-lost brother, but on the other hand you could print these pictures in manuals of masala acting under REALIZATION!!! and OHNOES!!! Ditto for some of the gestures. On the left, she extends her hands to her brother before clutching them at her heart as she realizes she can never meet him; on the right she extends her hands to the proper authorities, ready to accept punishment for her life of crime. Parallels: we can haz them! The dialogues are in for textbook masala-ness too. Zeenat's necklace has a key role. 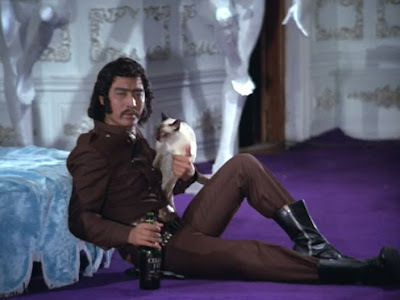 Danny Denzongpa has a small but juicy role as a be-fro'ed villain in a cowboy belt and cradling a cat. The director/writer, O. P. Ralhan, also appears as a photographer who keeps crossing paths with Sunil Dutt's investigation. His studio includes framed posters of puppies. 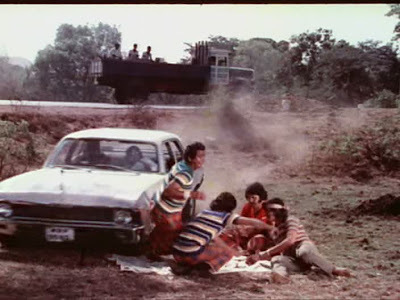 Zeenat drives like a maniac. Prem Chorpa is gross (in a pleasing way). Don't let the rickrack fool you into thinking she's a girl scout. I wish I knew what hotel this is; it appears to have a great view of Marine Drive. It may also be the location of my favorite staircase. The characters talk about going to Hotel Volga, but I don't know if that's the location's actual name. Love the view from inside the staircase on the bottom right! More amazing interiors. 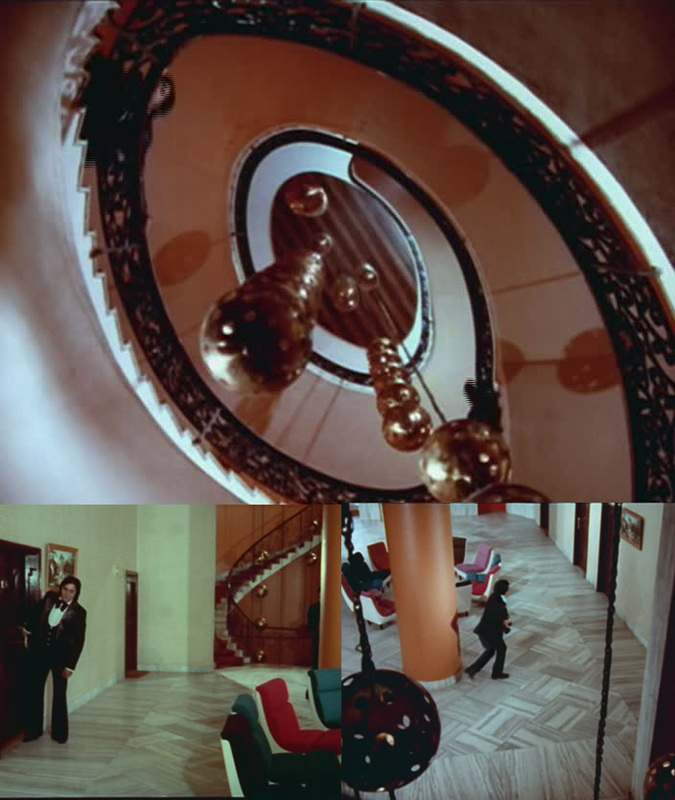 All of these are the villain HQ except the bottom right, which if memory serves is Iftekhar's living room. Please note the top left image, which shows the lair furniture made of statues of naked women bending over to support table tops. SO CLASSY. 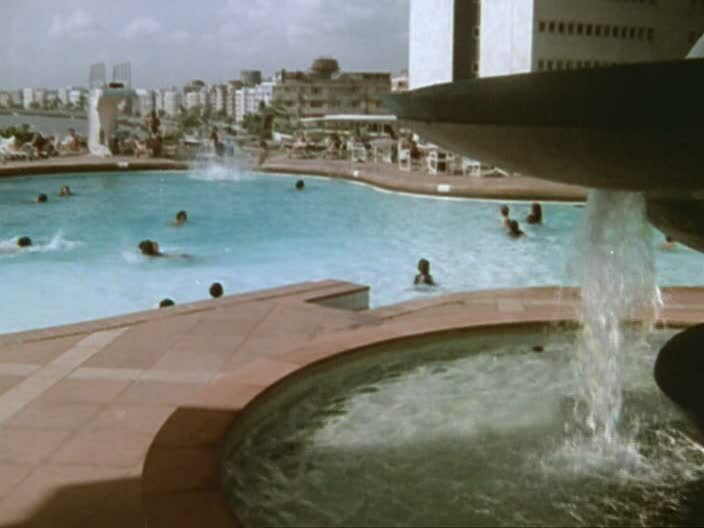 See them in "Shamma Jale" here. Of course there are great clothes. I am especially fond of the men's shirts, but the ladies get some fun nighttime and performance wear. 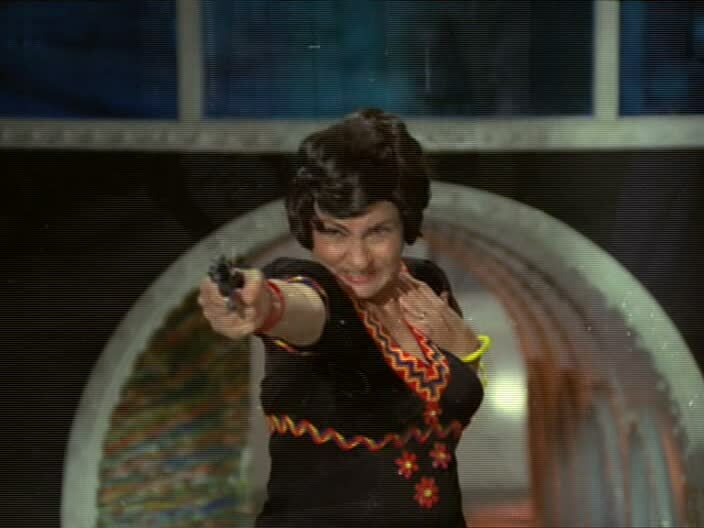 And Reena Roy's heart-bordered sari is a level of hilarious-yet-adorable that I've never before sampled. So: watch Paapi. The hat will never lead you astray. * Its only 1970s flaw: somehow not managing to include any of the Kapoor family. What I just said on Temple's sister post applies just as well here: I love that Hindi movies offer a seemingly bottomless treasure put of this kind of stuff. LOVE IT. I want to see both of the films you two have reviewed here - hers for Amjad Khan, and yours for so many reasons, but that Nadira still is very high on the list. Re: Nadira: her role here is very small but it is full of delights. Looking at the visuals alone I can tell i would be satisfied with this film, and that windy staircase reminds me of a similar one from Fakira, could they be the same location? I think I had OD'd on OP Ralhan when I watched this, because the plot got to me after a while. But yes, the outfits and hairstyles and decor and everything...ZOMG. 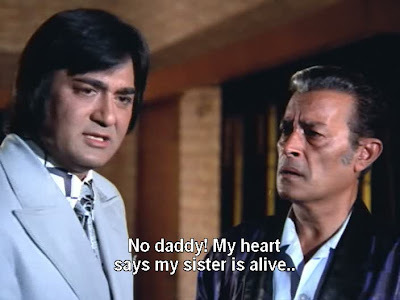 I adore 1970s Sunil Dutt, I can't help myself (and I got that exact same ss of Danny, love it). bollywooddeewana - Yes, same one! I am desperate to find out where that is! Temple - I will happily send my copy traveling if you need it. This movie needs to be seen. FOR SCIENCE if nothing else. memsaab - I read your review after I watched this and had a sense that somehow we were in very different frames of mind at the times of our respective viewings. :) It's rare, I think, that one of us finds something so fun and the other doesn't? Maybe the windup to me actually getting to watch this helped it - I owned it for about 3 weeks before I could finally get to a DVD player and have time to see it. Daniel - I think you're on to something! :) Do let me know the success of any a hat-based selections. This is truly an obscure film; I doubt if anyone would remember anything about it today, so congratulations on your discovery.